Facebook’s troubles continue as the company has just announced that the platform experienced a “bug” that set the audience for tens of millions of people’s posts to “public” even if they had set their privacy settings to share them with a smaller audience. This bug affects posts shared between May 18 and May 22. However, it appears that the company didn’t change the settings back to what the users had set until May 27. The bug apparently happened because Facebook was building a new “featured items” option that highlights content on profiles. These items are visible to the public, however, the company extended that setting to all the new posts, TechCrunch reports. Seems like another side effect of the company’s now-publicly-discarded “move fast, break things” motto. “We’d like to apologize for this mistake,” Erin Egan, Facebook’s chief privacy officer, said in today’s statement. 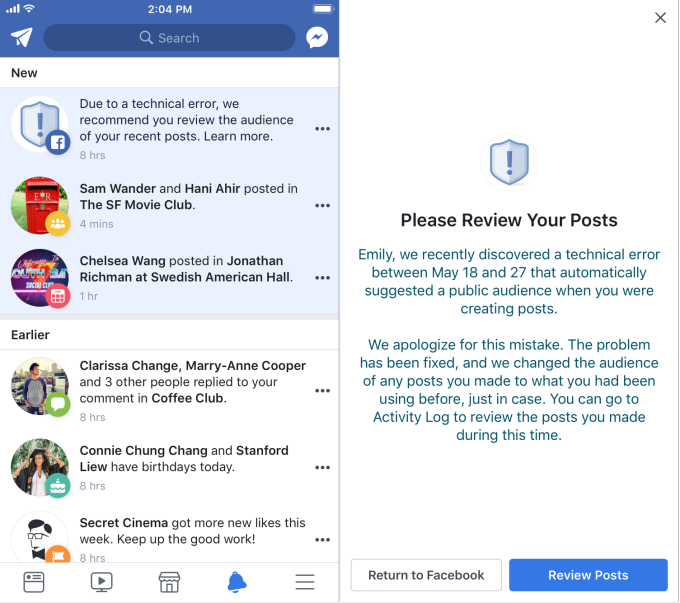 We recently found a bug that automatically suggested posting publicly when some people were creating their Facebook posts. We have fixed this issue and starting today we are letting everyone affected know and asking them to review any posts they made during that time. To be clear, this bug did not impact anything people had posted before – and they could still choose their audience just as they always have. The company said that it’s informing 14 million of its users who may have accidentally shared their posts publicly because of this bug. Today’s disclosure is a latest in what appears to be an ongoing string of privacy disasters that just keep coming since the Cambridge Analytica scandal came to the fore. Only earlier this week, a damning report revealed that Facebook had shared user data with over 60 phone makers, including Chinese companies sparking concerns and questions from the lawmakers.